From my travel experience I’ve gotten pretty used to packing myself a carry-on bag – here’s what I find to be those necessary essentials. The tote bag isn’t essential, but a smaller bag to keep on you can be very handy. 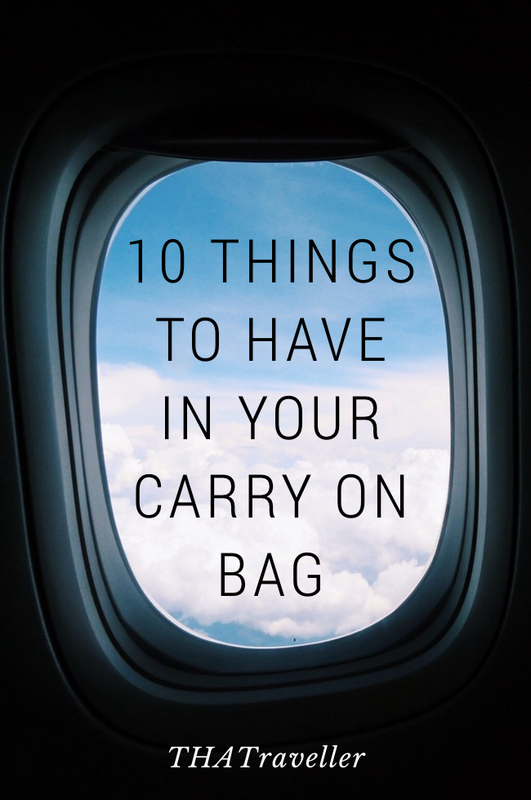 Rather than the hassle of retrieving your things from the overhead locker, keep things you’ll want on you in a smaller bag to keep under the chair in front of you – things like; laptops, headphones and passports/tickets to fill out immigration forms. Camera: Now, when I travel I usually have a camera bag that I stow in the overhead lockers – however I always keep a smaller camera on me to take those classic window seat photos. Phone cords: Keep these stored neatly in a glasses case to keep them from getting tangled in your things. Universal Power Plug: go for a power strip. On long haul flights, meals become the only thing to wait for, this can be a grueling process. Having some of your own snacks can help keep you from going hunger-crazy. Some easy snacks that can last for a while can include things like; trail mix. Mints (NOT GUM): Although gum is said to help with that painful ear-popping feeling, do your in-flight neighbor a favour and don’t bring gum – No one wants to listen to someone constantly chewing. Face wipes: Before going to sleep, an easy way to wake up feeling refreshed is to tie back and long hair, wipe down your face – removing any makeup, or just to give you a clean feeling, and then moisturize. This method is sure to have you waking up feeling a new. Deodorant: This goes without saying – I hope you have never been stuck next to someone who decided not to shower before the flight – it’s terrible. Something I haven’t done myself, but probably should – is to bring along a spare pair of clothes – something simple, like a t-shirt and pants. It’s a good idea to pack these in the rare case that your luggage is lost. I myself think it’s also a good idea, because after a long haul flight I usually feel a little icky wearing the same clothes for so long. This way I can depart the plane feeling a new. What do you need in your carry-on bag?